SALT LAKE CITY, UT, Dec. 4, 2013 — Known for blending non-motorized river rafting with wilderness adventure and backcountry comfort, Holiday River Expeditions is going the extra mile in 2014 to introduce wellness and therapeutic yoga into the vacation mix. 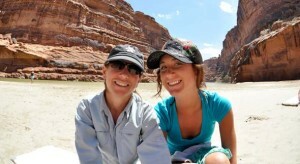 Their new Women’s Therapeutic Yoga Adventure will take place on the Green River through Desolation Canyon, June 2-6, 2014 and is priced at $1,140 per person, plus $25 BLM Fee. In a women-only atmosphere, personalized wellness and lifestyle counseling coupled with yoga will be led by Deanna English, a registered nurse, yoga therapist and integrative health coach. She holds special certifications in cardiac and cancer yoga, chronic pain, medical massage body work and reiki energy work. Designed specifically NOT to be your standard Women’s Yoga Retreat, this Green River trip through Desolation Canyon offers an open door to all women, of all ages and ability. Special emphasis will be placed on the aging process and those with physical challenges such as MS, arthritis, weight control, chronic pain and sports injury. “We wanted to break through the stereotype that yoga retreats are only for fit bodies in cute yoga clothes. Our Women’s Therapeutic Yoga trip is open to all women, all ages, and all body types. Wellness yoga is a fast growing niche that we wanted to represent in our programming,” explains Karen Johnson, Holiday River Expeditions spokesperson. In a small group atmosphere, this trip will focus on the body in all of its marvelous manifestations, including the need for special needs, circumstances, and considerations. The physical asanas/postures will be adapted to and personalized to the unique needs and situations of the group. Over the course of the five days participants will be treated to Holiday River Expeditions’ bar-setting brand of exciting rafting, camp comfort, campfire cuisine and service. Highlights include: fun Class II-III rapids that build in intensity each day, big beach camps with plenty of room for yoga, solo and tandem inflatable kayaking opportunities, dramatic canyon scenery, guides side canyon hiking and plenty of down time for Yoga, chat or meditation. Desolation and Gray canyons are on the National Register of Historic Places because the famous and infamous were drawn here. In 1830, trapper Denis Julien left graffiti on the canyon walls. Almost 40 years later, John Wesley Powell traveled through the canyons and christened them. Soon after Powell passed through, Butch Cassidy and the Sundance Kid found this a great place to escape justice. The Green River cuts a series of chasms through the Tavaputs Plateau and forms a gorge deeper than the Grand Canyon at Bright Angel Creek (5500′). There are petroglyphs, ruins, abandoned homesteads and marvelous camping sites among verdant cottonwoods on soft sand beaches. This is a perfect river for both first timers and seasoned river runners. Women’s River & Yoga Retreat on the Green River through Lodore Canyon, four days/three nights, July 11-14, 2014 priced at $995 per person. Yoga On The River with Dana Menlove on the Main Salmon River, six days/five nights, Aug 1-6, 2014 priced at $1,510 per person. Holiday River Expeditions (https://www.bikeraft.com/) began in 1966, when Dee Holladay and his wife Sue took the plunge to become river outfitters. Due to its respect for the lands, rivers, guests and employees, the family-owned-and-operated company has grown exponentially. Each of its guides is professionally trained in first aid and river safety, and with over 47 years of experience, the company provides guests the opportunity explore the nation’s wild lands safely and securely. Holiday River Expeditions has a philosophy to protect the environment through education and conservation, and as such, uses oar-powered and paddle rafts.